Representational photo of GHADC office in Tura. 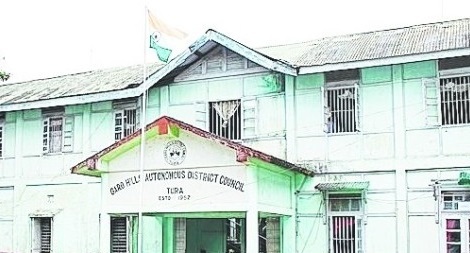 Deputy Chairman in the Garo Hills Autonomous District Council Mettrinson G Momin has resigned from NPP and announced to contest the upcoming assembly election as an independent candidate from Rongjeng. Momin is MDC from Darugre in East Garo Hills district resigned from NPP claiming that the party has decided not to issue ticket to him to fight the assembly elections from Rongjeng. In all possibility, NPP will issue ticket to Jim Sangma, a local school teacher. Momin, a former Congress member, was one of the top contenders for the NPP ticket and had already begun his campaign for the upcoming election scheduled to be held in February. With Momin’s resignation, the NPP is now left with only eight MDCs in the district council. Though Momin has announced to contest as an independent candidate from Rongjeng, there are reports that he has been in touch with Chief Minister Mukul Sangma for a Congress ticket. The sitting Congress MLA Sengnam Marak may not get the party ticket for his poor performance. Sources in the political circles in Rongjeng told Northeast Now that Momin is in constant touch with Cherak W. Momin, the Congress legislator from the neighbouring Kharkutta constituency. The Kharkutta MLA reportedly is trying to convince the Chief Minister and the MPCC leadership that Mettrinson G Momin will be the best possible candidate for the party from Rongjeng. People in the constituency are not at all happy with the sitting Congress MLA for his poor development works and his drunken brawls in the locality.